Brussels - An unknown number of Orthodox Jews are among the thousands of passengers currently stranded in a hangar at the Brussels airport following a pair of deadly explosions this morning. The death toll is currently at 31 with another 55 injured in the bomb blasts. Two Belzer Chasidim are among the injured according to Kikar HaShabbat. Chaim Winternitz, a Jerusalem resident, was in Antwerp for a family simcha and was returning home with his family at the time of the blast. Winternitz, who sustained an injury to his leg, has already been released from the hospital and is expected to return to Israel soon with his family. 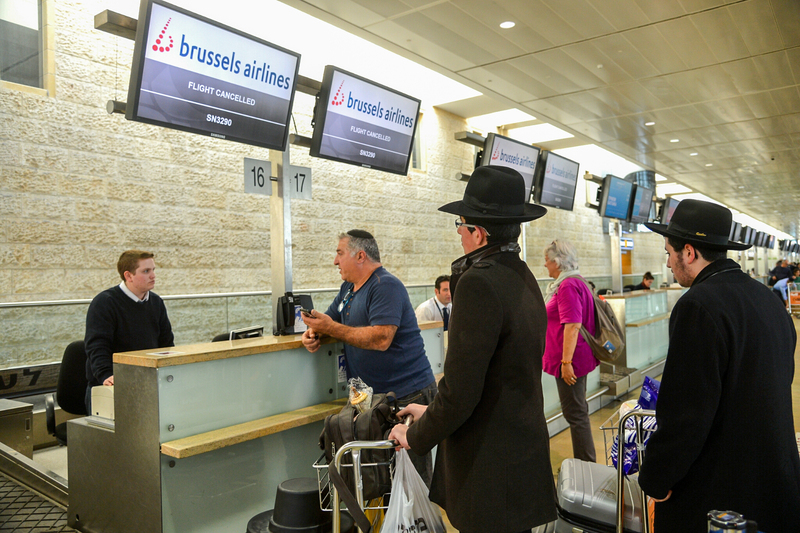 A second unidentified Chasidic victim sustained a broken leg and is currently undergoing surgery in a Belgian hospital. An amateur video posted to YouTube, that is being broadcasted widely by all major media outlets, shows the devastation at the airport terminal, with plumes of grey smoke pouring out of the building’s shattered windows. Passengers can be seen fleeing the terminal and two Yiddish speaking men can be heard among the crowd, with one telling the other that they need to leave before another bomb explodes. Yisroel Yaakov Yeret of Ichud Hatzolah was among those who was davening Shachris at the airport when the explosions took place. Yeret was on his way from Israel to the United States at the time of the attack. Yeret said that the passengers were evacuated to a large hangar where they are being bused in groups of 50 to an unknown location. Yeret says United Hatzolah volunteers were assisting paramedics who came to treat the injured. Purim may be just days away but the Jewish community of Brussels is living in fear instead of joy. Rabbi Gigi said that at the time of the attack the main synagogue in Brussels offered shelter to non-Jewish students who were in shock after the attack. Plans for a Purim chagiga and concert scheduled for tomorrow night remain up in the air pending further instructions from Belgian security. Rabbi Gigi extended the condolences of the Jewish community to the bereaved and wishes for a speedy recovery to the injured. “May G-d have mercy on Europe,” said Rabbi Gigi. Europe swapped Jews for Muslims and is now reaping the results. i hate to say this, but the Belgian attacks, as horrific as they are, are being covered non- stop nationally, while the terror and horror of achaynu in ey is barely mentioned on any given radio dial or television channel. Too bad Hitler ym"sh is not here to witness what his yundenrein achieved. Pretty coincidental that the world's must anti-Semitic countries get hit hardest by the Moslems, for example Belgium, France, Turkey. Maybe countries should rethink who they allow into their borders. Maybe the USA liberals should do the same? and the world is upset when Trump said he would NOT allow Mooslims into America? Not every Mooslim is a terrorist, but every terrorist is a mooslim. My French is a bit rusty, but from what I read in the Belgian press, the first identified victim is Yossef Haïm ben Haya Sarah Gittel. I hope our rabonnim don't blame this on women's driving or not being dressed properly or using cell phones.